1-minute walk to MTR Yau Ma Tei Station. 5-minutes walk to tourist attractions including Ladies’ Market, Sports Street, Electrical Appliance Street, Fruit Market and the newly renovated Chinese Opera Theatre. Contemporary-designed ballrooms are suitable for any kind of business meetings, conferences and banqueting functions. 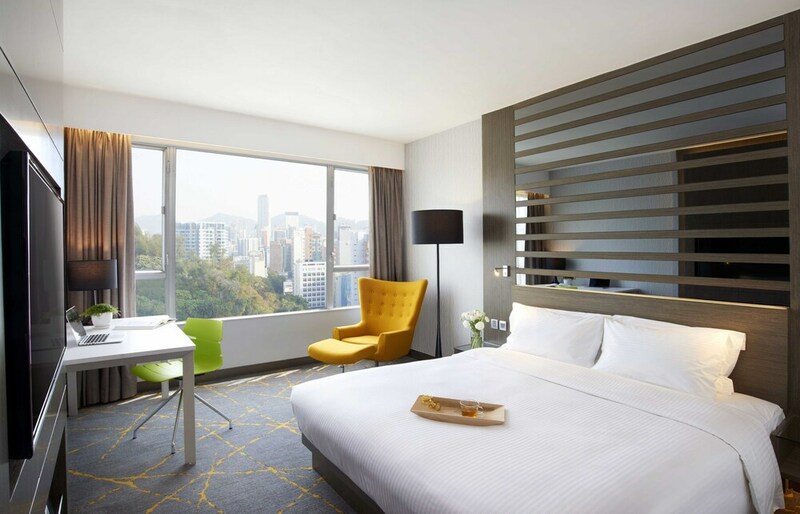 In addition to city views, all guestrooms of The Cityview offer free WiFi, cable TVs, refrigerators, and in-room safes. Boasting a prestigious address in the heart of Yau Ma Tei – filled with unique cultural and urban charm – The Cityview sits adjacent to the bustling Nathan Road, the famous shopping and entertainment district renowned for its historical buildings and famous attractions like the Temple Street Night Market, Yau Ma Tei Wholesale Fruit Market, Ladies’ Market, and the newly remodeled Chinese Opera Theatre. The Cityview provides unique accommodations by means of initiatives such as dedicated live plant walls in the lobby, plus in-room environmentally friendly facilities as well as a smoke free environment. The Cityview offers workstations with WiFi access in the lobby. Business facilities such as photocopying, printing, faxing, and courier services can be organized through reception (surcharge). Business services: The Cityview offers workstations with high-speed wireless Internet access in the lobby. Business facilities such as photocopying, printing, faxing, and courier services can be organized through reception (surcharges apply). Conference/function room(s): There are two function rooms in the hotel. The smaller function room is 174 square meters (1,800 square feet) whereas the ballroom is 212 square meters (2,200 square feet). Amazing - Offering popular, quintessential Thai-style cuisine. Freshly prepared authentic dishes brimming with five basic flavors - sweet, sour, bitter, salty, and spicy – are all unique with exquisite ingredients, delicious flavor combinations, and stunning aesthetic presentations. There’s also a great variety of barbecue and curry items as well as marvelous deep-fried creations. Features a garden setting and skylight to provide natural light. City Café - Refreshing lime green coloring provides an appealing urban vibe while the parchment color of the oak wood ceiling and wall evokes the beauty of nature. The open-style kitchen enables the Chef to demonstrate for diners, and the bar serves specialty cocktails. Located on the first floor. The Balcony - This restaurant's simple interior offers a flair of Chinese classic décor, and the cuisine features traditional homemade Cantonese delicacies. Located on the first floor. King's Park, with running or walking tracks, is one block from the hotel.